I answered my phone back in September. On the other end was a woman who would soon change my outlook on life and make me realize just how strong the human spirit truly is. Her name is Anne Carr. Anne and her husband Tom moved to Charleston in 2008 and have been visiting for more than 30 years. 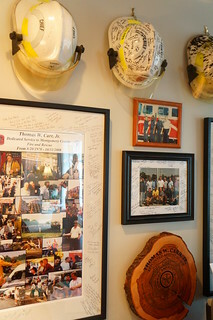 They moved to Charleston from Montgomery County, Maryland just outside of DC where Tom was fire chief and dedicated his life to fire and rescue. 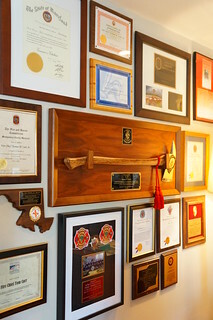 He was involved in the Oklahoma bombing aftermath, he was at the Pentagon after 9/11 and is highly decorated with awards and medals from his 30+ years of service. Tom was hired on as the new Fire Chief of the City of Charleston by Mayor Joe Riley. Shortly after taking on this role, Tom started having trouble with his arm and was treated for tennis elbow. When it moved up to his shoulder and wasn’t getting any better the doctors diagnosed him with Parkinson’s. Tom didn’t have the shakes however, and treatment just wasn’t working. After going to the Mayo clinic, Tom was properly diagnosed with MSA, or Multiple System Atrophy in September 2011. MSA is best described as Parkinson’s on steroids. It is a rare condition that damages the nervous system and slowly causes loss of physical functions. The survival time is 7-9 years. Since then, Tom has had to retire and his home had to be altered to suit his needs. For six months, Anne and Tom moved to Sullivan’s Island while their West Ashley home was being reconstructed with ramps, a new master bath, and outdoor living space. During this time Anne was moving boxes when one fell off a shelf and hit her in the chest. It hurt more than usual and she decided to go see someone about it. Doctors found a small lump in her breast and determined Anne had triple negative breast cancer in July 2012. Triple negative breast cancer is one of the more aggressive subtypes and one that is more likely to recur in the breast or elsewhere in the body in the first 3 years post treatment. Fortunately, it does respond well to chemotherapy as opposed to hormone treatments. Anne has had a lumpectomy and months of chemo and has managed to take care of Tom through it all. She has had help from hospice and a family nurse. Her grown children have also moved back. I call her courageously strong…she calls it being stubborn. When Anne called me back in September, they had recently moved back in and the house was in disarray. She was planning a retirement party for Tom to be held at the house the end of October (I told you this woman is strong). We had a lot of work to do in about 5 weeks. Realistically, we had to prioritize; re-upholstery and built-ins would have to wait until after the party. First thing first…paint! 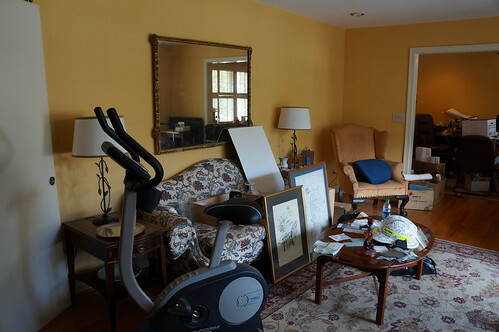 Before, the living room was yellow, the handed down and “picked” furniture needed attention (yet another reason I love Anne, she loves to shop secondhand), and other than the mirror, the walls were bare. 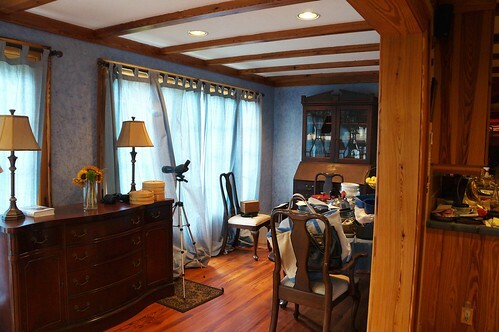 The dining area is long and narrow and was painted with an 80s faux finish in blue. The ceiling felt low because the dark beams drew your eye up (we’re not quite sure what the previous owner was going for, but oh well, it worked for them). Even with the wall of windows, the room felt dark and the family antiques got lost with all of the wood. 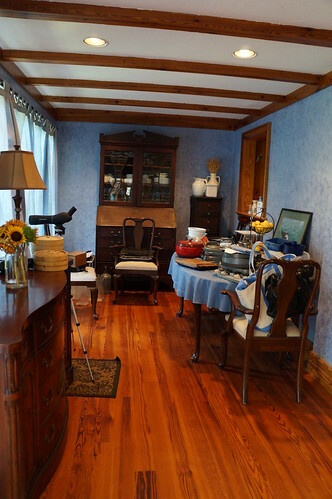 We started by painting all of the walls Sherwin Williams Agreeable Gray and the ceiling and trim Snowbound. Wow, what a difference paint makes! 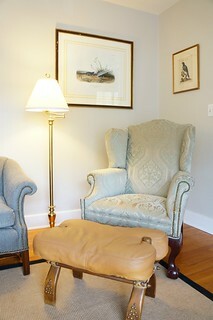 Anne inherited some great pieces of furniture from Tom’s family including the early 1900s wingback and footstool and a pair of tufted slipper chairs. The couch was one of Anne’s finds. 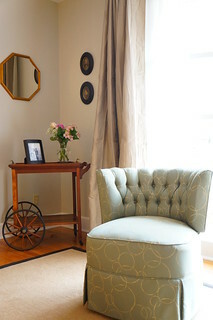 All were re-upholstered in gorgeous coordinating fabrics. 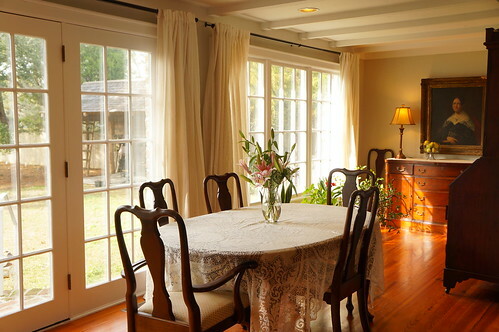 I think the biggest transformation was in the dining area. The beams no longer stand out having been painted the same color as the ceiling. 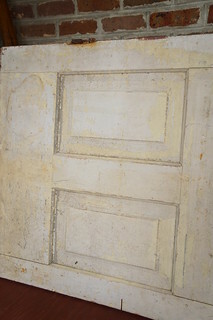 The doors and trim work were painted as well. I choose a subtle ivory striped linen curtain that filters the bright afternoon sun. 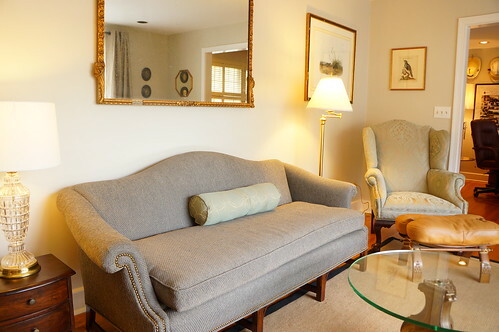 When drawn, the room still feels light and airy. 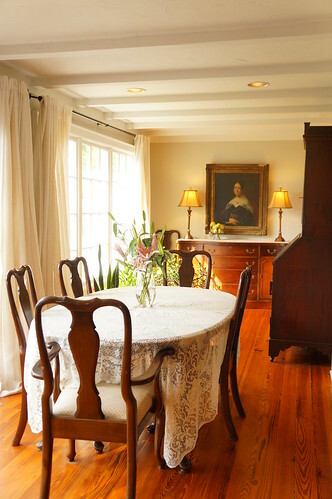 Now Anne and Tom’s family antiques take center stage to give the room a traditional and inviting feel. 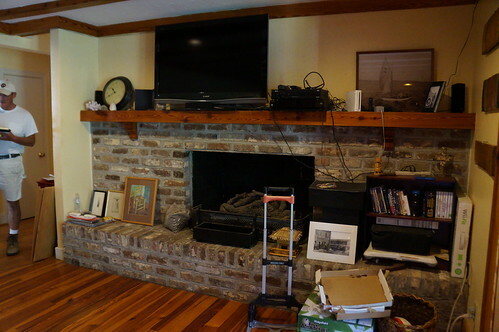 The huge fireplace was surrounded by brick and made that side of the room feel heavy. Anne had a great idea! 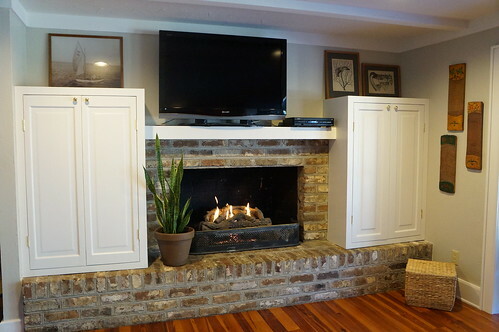 She wanted to use old doors to construct built-ins on either side of the fireplace. She told me we could find these doors under the house of Tom’s aunts who live South of Broad. So I met Anne there one morning, she with her head lamp and me with my flashlight. We ducked our heads and went under this house. We went through a pile of probably 15 doors to find the right ones. Again, the mental and physical strength of this woman amazes me. Not only did we find doors, we discovered old decorative iron fireplace covers and iron sheets embossed with what looks like Greek figures (Anne is saving those for another project). Now the brick isn’t so overwhelming and the Carrs have plenty of storage. What a great way to convert all that unused space and we used pieces of the past to do it! Since September, the house has been transformed to a lighter and brighter space that shows off all of Anne’s pieces she has collected over the years. She feels good about her home and comfortable having people over. Through this 4 month transformation, Anne has reinforced the thought “don’t sweat the small stuff”. The little things will work out and if they don’t, it’s okay. Anne is an inspiration and a pillar of strength. 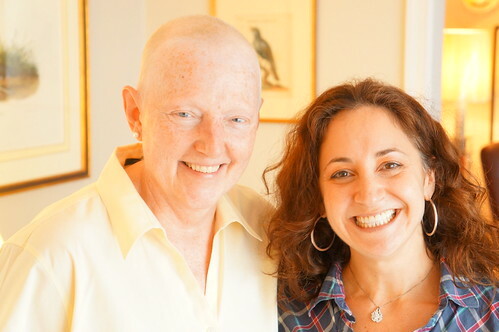 I’m happy to say she had her final chemo treatment Friday, 1/18/13 and the outcome looks very good. Tom is doing well and hanging on just as strong. Thank you Anne, for making that call back in September. Knowing you makes me a stronger person.